We have recently placed 2 orders with CableChick. What can we say: Flawless web site, ordering and payment process. Lightening fast delivery and to top it off: Great looking invoice. Keep up the good work! If you're one of the lucky ones who lives in an area that offers premium cable internet speeds from certain CBD exchanges, you're probably looking to retain as much speed on your internet as possible. 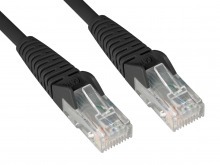 Now, Cat6 won't make your modem run any faster, but it will ensure that it can run at its absolute peak of efficiency by eliminating packet loss with better build quality and materials over Cat5e. And then later, when we have even faster broadband and LAN networks, you'll be able to use the same trendy black Cat6 cable you scored from Cable Chick and run it at speeds up to 10gbps. It really is a win-win for anybody looking to future-proof their home or office. Because as history has shown; things are only going to get faster! 5 Year Cable Chick Warranty! Did you know Cable Chick also stock Android Accessories? 30+ In Stock Ships by 4PM Today! Order was received within 48hrs and everything was exactly as described and of high quality - I'll definitely come back for future purchases. Did you know Cable Chick also stock Wall & Ceiling Speakers?